Deck design is a very personal task. Your home's style should be a major factor or it will feel out of place. Over the years, we have seen each metropolitan area develop its own style of design. One builder takes an idea from another and, eventually, you have a flavor all its own that develops in your city. Then, you have a wide selection of manufacturers that have created as many as 2-10 product designs for you to choose from. There has been no lack of creativity in the deck industry over the past 5-10 years. The most common mistake in deck design is simply attaching a deck to fit an existing ledger board or replacing an exact copy of an old deck. This approach will limit your options and stifle the creative process. Home builders often add ledger boards and decks as an afterthought. It may not even be attached properly. The house door will serve as the primary access to your deck. The position of your door will determine your decks initial elevation. Low decks (less than 30" above grade) do not require guardrails. They look relatively squat and massive. The ground under a low deck will be concealed to view but can become a home for small animals or insects. Consider ventilation because the more a low deck can "breathe," the more mold- and mildew-resistant it will be. Higher decks will appear more lightweight, like a floating platform. Guardrails will be required and long stretches of stairs are usually necessary. High decks offer an opportunity to showcase views of the surrounding landscape. The space underneath the deck is a great place for storage or a screened-in area for rainy days. What kind of views do you have to work with - a breathtaking snow capped mountain peak or an ugly water tower? Spend some time in the space at different times of day to get an idea of what kind of day lighting you can expect. Do you have any trees that provide spotted shade? If not, you may want to incorporate a shade feature. Is your yard flat or sloping? Do you have a pool, patio, hot tub or garden? A good design will accentuate the advantages of the site, whereas a poor design will bring attention to its flaws. The shape of your lot may affect the size and positioning of your deck. Landscaping, small trees, vents and AC Units can be adjusted if necessary. Sometimes large trees can be framed around your deck design, as well. Most people want to design their own deck but often do not know how to start. This is how we suggest you start. Try exploring the big picture. Don’t get hung up on details. Use your imagination. If you are still saying things like “I want a deck just like our last house,” you are not trying hard enough. Don’t be afraid to think big and bold. Perhaps you would enjoy owning your own private terraced oasis, an elegant veranda or some other outdoor space. This approach will typically lead to better results than deciding on a replica of your neighbor’s deck. You probably won’t be able to fully realize all of these visions but, in the end, it will be worth it if you can blend a few of them into the final design. Now, let’s decide upon what you really need to accomplish your dream deck. Do you need a way to access the backyard from an elevated patio door? Do you need a good place to keep your grill? Do you need a space for outdoor summer dining, relaxing and entertaining? Recognizing and negotiating your needs and wants will be a critical component in expressing your design intentions. Think about how foot traffic will flow across your deck. Make sure that your furniture and grill arrangements do not interfere with movement. Your stairs and the house door should be easy to locate and free to access from any area of your deck. Guardrails will usually define the perimeter on taller decks. A short rail or benches can help guide traffic and maintain views for a low deck where guardrails are not required. The interior spaces of the deck need to include aisles for movement. Changing the direction of decking can be a useful technique to separate spaces. Pointing diagonal decking in a certain direction is a subtle cue to direct people's path of movement. Your deck stairs will anchor your deck to the yard and act as a primary point of access. Measure the height of your deck and use our Stairs Calculator to determine the number of steps you need. Long sets of stairs can be gently wrapped around a deck or split by a set of landings to reduce their awkwardness. Avoid landing stairs underneath a deck frame because of headroom issues. Multiple levels can be used to gracefully move people across your deck in interesting ways, but be aware that severe and sudden changes in elevation are not only awkward-looking, but also can be dangerous. Steps that form irregular angles or that are difficult to see may cause a tripping hazard. For low decks, consider stepping down around an angled corner with a cascading wrap around the stairs to help blend the deck into the yard. Create a path for smooth traffic flow. Choosing the right type of decking for your design is a very important decision. Some people prefer the look and feel of real wood like cedar, redwood or exotic hardwoods over man-made materials. Other people are fans of low-maintenance materials that offer a variety of colors and textures. 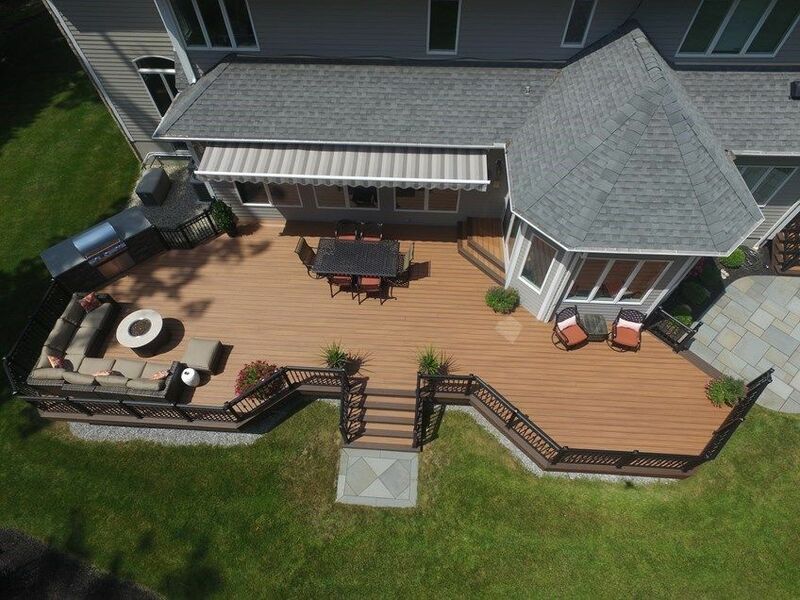 Researching decking materials is key to making the right decision for you and your lifestyle. Hidden fasteners will eliminate screw or nail placements in the floor. Reverse trim head composite screws are recommended over nails for composite decking for holding strength and to prevent mushroomed screw holes. Wood decks will need to be stained to protect the wood from cracking and warping. A variety of stain colors are available from natural to deep reds, browns and grays. Color is a very important part of design. The playful use of contrast with a border can add a spark of life to any deck. Large decks with broad expanses of redundant floor treatment often will appear too plain. Decking applied diagonally or in a herringbone pattern can focus attention towards a particular space or view. Some designers even create a unique floor inlay to add some character to their deck. 1) Go Ahead, It's All Free! Literally tens of millions of decks have been built over the past few decades, which means there’s no lack of well-tested deck design ideas. 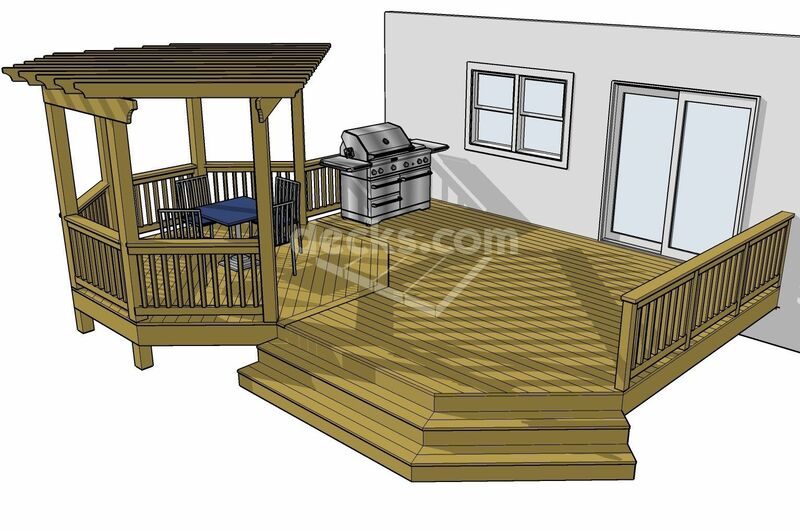 Check out Decks.com’s free deck plans or our free deck designer, which you can easily customize to fit in your yard and against your house. And, spend some time scanning our large “Pictures” section, where you’ll find a huge number of great deck designs. If you see something you like, co-opt it for your purposes. Start with general ideas of what the deck can do to enhance your life. What will you really use the deck for? For instance, if you’re not a party animal, maybe you want to emphasize intimate gathering and dining areas. If you love to grill, go a little wild with an outdoor kitchen. Ask family members what they’d like from your future deck. Consider design elements, such as a friendly conversation pit, container gardening, a spa to soak in, or just a clear path for taking out the garbage. Once you’ve got your priorities right, plan a deck that allows enough space for the activities you enjoy, as well as comfortable traffic pathways between and around them. Often, these areas will be visible only after furniture has been set out. 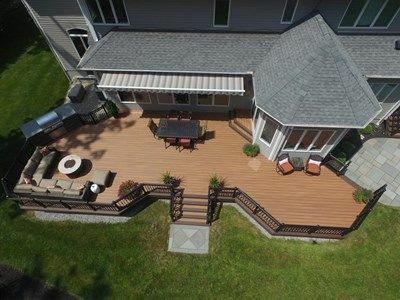 You can think of your deck as having specific “rooms” for dining, lounging, cooking and mingling. Make sure that there will be ample room for chairs around a dining table, small end tables or a coffee table next to lounge furniture and potted plants. For the finish materials - the decking, railing, fascia and perhaps skirt - many people today choose to spend a hefty amount for composites, PVC and other materials that are low maintenance. Others prefer to save their money and build with inexpensive treated or (somewhat less inexpensive) cedar. Wood surfaces often need to be pressure-washed and sealed once a year. But, if you prefer the natural look and don’t mind regular maintenance, it may be the choice for you. Some say that a deck should be no larger than 20 percent of the house’s square footage, so as not to overwhelm a house visually. But, if you spend plenty of time on it, and if it is divided up into clearly different rooms, a larger deck can look and feel quite at home. There’s nothing wrong with a rectangular deck, but consider adding pizzazz with angles or even curves. They will take additional time to build, but can make a deck feel special rather than cookie-cutter. Design with a “theme and variation” approach, so that a certain angle or curve gets repeated, perhaps with different sizes, at various places. If you love to cook outdoors and like interacting with people as you grill, plan an elaborate outdoor kitchen with a counter and several cooking appliances. You might want to include an eating counter with stools just opposite the cooking area, so people can snack, sample and offer advice while you cook. If you’d rather keep food prep simple, you may want to make a small alcove off to the side, with just enough room for a grill. Or, you may choose to do all your cooking indoors. There’s no law saying you have to own a grill. Consider the view, both from the deck and from inside the house. If there is a bulky railing between you and what you want to see, your deck will be a less inviting place. Here are some possible solutions. Step the deck down with platforms or descending sections, which will lower the railings or perhaps make it possible to do without them. Or, choose railings with thin balusters, or even glass panels. Also, if a certain view pleases more than others, plan your deck’s “rooms” so that people will naturally turn in that direction. You may choose to build a deck in a style that blends with the house, or you may prefer to make your deck a clearly different place, emphasizing its outdoorsy ambience. Where the deck steps down to meet the yard, it often looks and feels best to have some transitional materials. Stones, pavers and bricks almost always look handsome next to a deck, whether it is built of natural wood or man-made materials. A deck-and-patio combination is a sure-fire winner. We think of a deck as basically a floor, but it’s the upright components - the railing, skirting and overhead structures - that actually make the most visual impact. There are a dizzying array of railing designs and components to choose among. Take your time to choose a railing that suits your space perfectly. If a deck is raised, you may want to install decorative skirting to cover its underside. If there is enough room for a patio below, consider installing a stay-dry system, so the patio can be a retreat when it rains. Unless you live in an area with perfect weather, you will likely enjoy your deck more in the summer if you have a shade structure. A pergola is the most common solution. It provides varying degrees of shade determined by how closely spaced the rafters are to each other. Where the sun is oppressive, consider an awning of some sort. Most decks also benefit from a planter or two. Or, plan on setting out large pots for your plants. Planters can be placed as a part of a railing system, or they can be joined to a bench. Hi, can I rotate the deck slat direction in your designer tool? seems like it is locked to vertical on the screen? Hi Ray, The deck designer can only create deck framing with the joists running out from the house. what about sloped deck plan? How do you rotate the stairs in the design mode. They only go at right angles to the sides and I want to turn the stairs on the Design to parallel the side? Nice tips, Thanks for sharing such a great ideas.